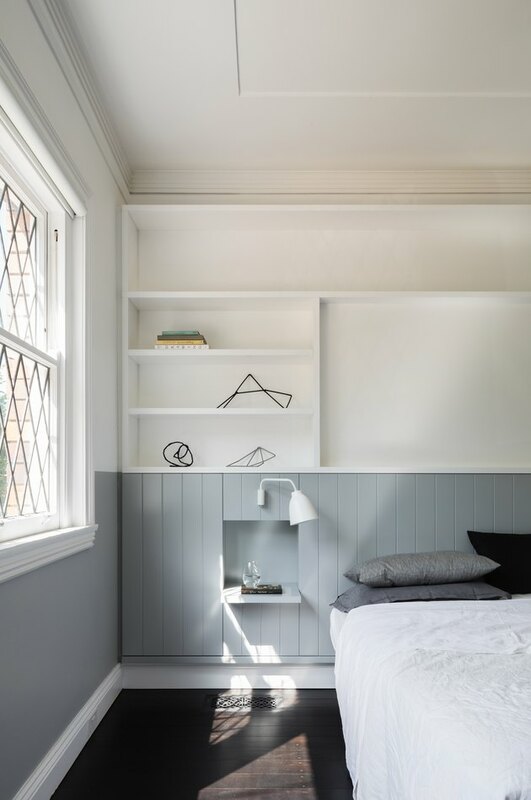 When a couple with two children fell in love with a cozy property on the North Shore of Sydney, Australia, they wanted to do something that most suburbanites crave: blend in while still standing out. The pair gravitated toward the home's traditional 1930s exterior, but they wanted to update the interior with a more cohesive layout and a stronger connection to the outdoors. Principal Hannah Tribe agreed, so when her namesake firm was hired for the job, she worked to blend the site's period charm into the mindset of a 21st century address. 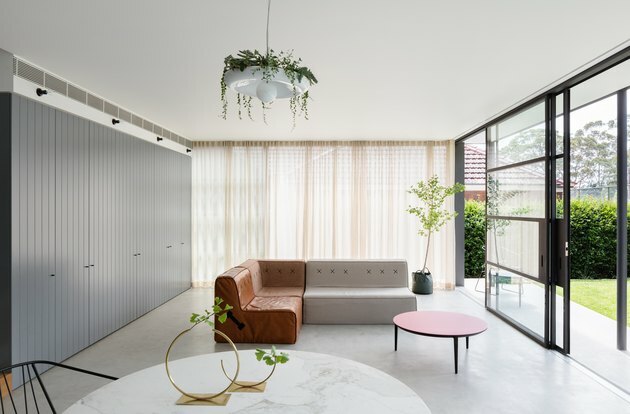 Her team decided that the best way to do this was to renovate the rear, and open the common areas to the garden for a striking, family-friendly space. "The brick sunburst on the front appears in the new rear elevation, and then leadlight windows at the front morph into steel framed windows at the rear," said managing associate director Miriam Green. When the project was complete, the historic qualities of the public's view were balanced with the private, modern aspects of what's behind the front door. That subtle consideration made for the ideal family home — and the ideal neighbor. The firm took inspiration from the home's original architecture, and it's surrounding neighbors, by retaining the front facade's detailing. The formal living room's walls were painted in a durable Dulux shade around the original fireplace. An Anita Armchair by SP01 sits beside it. Meanwhile, the rear of the house was completely renovated. It now showcases an open-plan kitchen and living area that's enclosed by sliding steel and glass doors. 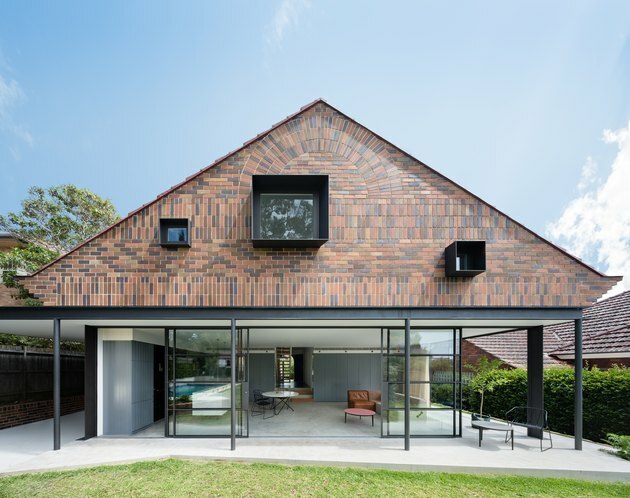 The gable's brickwork references the style of the front elevation. Koskela pendant lights hang above the kitchen island, which is finished in Elba stone by Artedomus. The dining area's table and chairs are by SP01, which all stand under a planted Babylon light by Ryan Taylor. A living area beside the kitchen features a Quadrant Soft sofa by Koskela and a coffee table by SP01 above polished concrete. A Koskela Licht pendant hangs in the hallway. The studio designed the staircase from solid timber and brass handrail hooks by BitPart. An airy, modern design continues in a master bedroom that features a bedside light by Lightyears and bedding by Society. A bathroom features bold blue tile and a tub with a Corian® surround.